Our time here in Peru got off to a little bit of a rocky start because I was sick with a fever our second day here and Matt and I have both been sick on and off since then. Despite that, we have made up for lost time. Lima is enormous. The first day we were wandering around, we kept saying, "This seems a lot like Auckland," only to be followed the next day by La Jolla (due to the beach cliffs and para-sailors), Los Angeles (traffic and smog), and Spain (plazas). 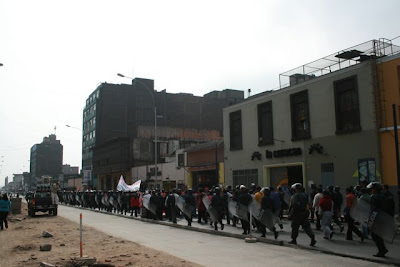 I guess Lima is just a place that reminds me of a lot of other places. In the midst of sickness and meetings for my master's research, we have tried to traverse the giant that is the city of Lima. And just like all other cities, once you begin to explore, there are little pockets of intrigue that cannot be found anywhere else. 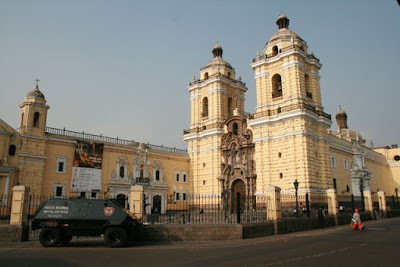 1) Francisco Pizarro is buried in the main cathedral in Central Lima. If you do not know, Pizarro was the Spanish explorer who conquered the Inca civilization by brutally killing many of the leaders, soldiers, and nobles, after tricking them by inviting them to a feast. He then took their gold and silver and established Peru. I don't know about you, but I would not say that Pizarro is a great man to be celebrated unless leading a massacre is worthy of celebration. 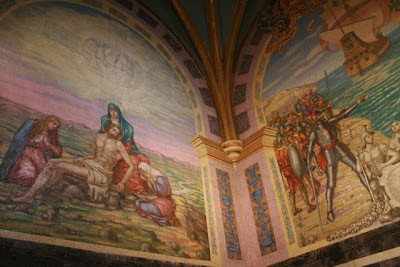 Yet in the cathedral he is honored right next to Jesus. I found that a bit ironic and comical. 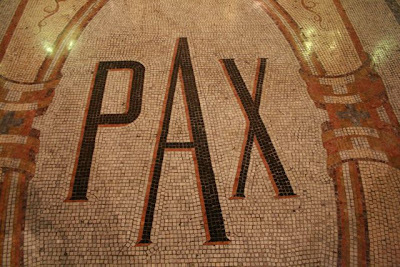 Not only that, but the floor in his room has the word "Pax" in large letters, which means peace. Hmmm... something there doesn't quite fit. Do you get that feeling? 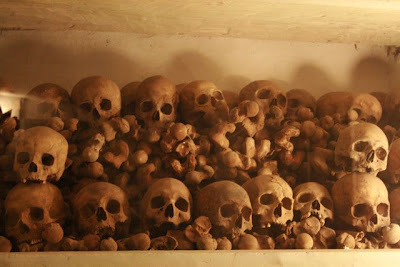 2) Underneath the Convent of San Francisco in Central Lima, there are catacombs. You actually pay to walk around in a cold, musty basement that you can't fully stand up in to see piles of dead people. And it is surprisingly thrilling. You are not allowed to take pictures of the ones in the catacombs, so this will have to do to appease your curiosity. 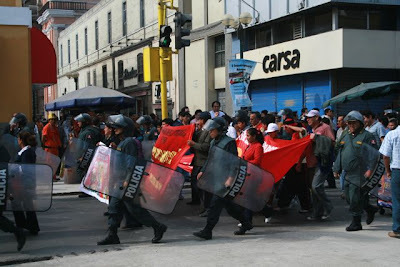 3) There were transportation strikes throughout Central Lima because of increased prices of tickets and gas. 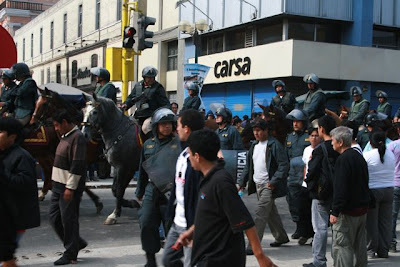 Apparently, this is something to be taken seriously because the main plaza was shut down to cars and there were cops everywhere in full regalia. The protest passed by where we were walking at one point and all of the store owners rushed around pulling down the metal roll up shutters over their windows. So Matt and I stood by and watched. Never a dull moment! Note the police riot tank framed by the beautiful church in the above picture. sick, i guess that is bound to happen when traveling to foreign places. just as long as it's not swine flu. so you made your contacts? the contrast of ancient churches against modern struggles. stay well kids and soak in all you can. as you know thee are memories that we last a life time and be woven into the fabric of who you are.